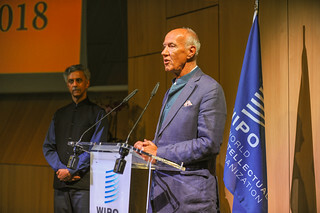 WIPO Director General Francis Gurry (right) inaugurated at WIPO on September 8, 2018, the 2nd edition of “Namaste” event, underlining the depth, diversity and richness of Indian culture. Ambassador Rajiv Kumar Chander, India's Permanent Representative to the United Nations Office in Geneva, also spoke at the inauguration. Namaste Geneva 2018 has become an annual event organized by India's Permanent Mission to the United Nations in Geneva and hosted at WIPO. The event showcases the talents of the Indian diaspora and friends of India living in Switzerland. Copyright: WIPO. Photo: Mauranne Di Matteo. This work is licensed under a Creative Commons Attribution-NonCommercial-NoDerivs 3.0 IGO License.